As part of their move to avoid violence and arrest of their leaders and activists, Jatiya Oikya Front senior leaders said they have taken a 'go slow' strategy over electioneering at present, as they have a target to stage huge showdowns and carry out hectic campaigns in the final week before the 11th parliamentary elections. They said they have already sent out strong messages to their grassroots to conduct their election campaign with caution without responding to any provocation by ruling party or law enforcers as they do not want to lose their strength before the December 30 election day. The Oikya Front leaders said they believe their alliance will come out successful if they can demonstrate their strength on the voting day and guard polling stations to prevent rigging and irregularities together with people. Besides, they said they hope that the situation will improve with the deployment of army across the country on December 24 which will pave a way for them to carry out frantic election campaigns during the last week of the election. "We know the ruling party will gradually be more desperate and attack our candidates and supporters to demoralise us, but if we now try to resist them it will only invite danger for us. So, we've decided to carry out our campaign peacefully as much as we can until the deployment of army. We'll intensify our campaign in fullswing from December 24," a BNP standing committee member wishing anonymity told UNB. He said they have a plan to hold a rally at Suhrawardy Udyan either on December 24 or December 26 from where they will give necessary directives to their party leaders and activists about demonstrating their strength on December 30. 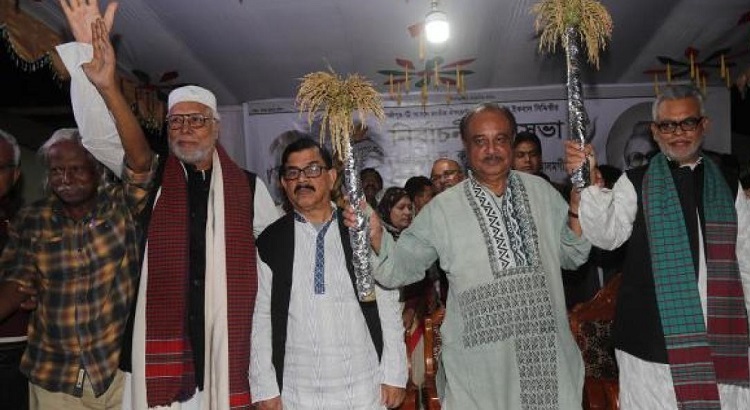 Meanwhile, senior leaders of the alliance launched their first election road march towards Mymensingh from the capital's Uttara area on Saturday to drum up public support in favour of the candidates of 'Sheaf of Paddy'. Dr, Kamal, who was supposed to lead the Oikya Front team, could not join the road march due to his illness. The Oikya Front leaders also have a plan to embark on a tour of Chattogram region on December 9 to carry out campaign in Cumilla, Feni, Noakhali and Chattogram in favour of their candidates. They also may go to Rajshahi division on December 22 for the electioneering. Contacted, BNP secretary general Mirza Fakhrul Islam Alamgir said the ruling party has created a war like situation across the country with their continuous attack on BNP candidates and their supporters as they want to frighten voters not to go to the polling stations. He said they asked their party leaders and activists to carry out campaign peacefully instead of responding to any provocative acts by their opponents. "The cadres of Awami League are trying to create trouble by instigating and attacking us. They're indulging in terrorism, but we don't do it. We're peacefully going to people and calling upon them to go to polling stations on December 30 to cast our vote for Sheaf of Paddy." Despite the prevailing serious adverse situation, Fakhrul said they will not quit the election race as they have taken party in the election as part of their movement for restoration of democracy and free Khaleda Zia from jail. He called upon the Election Commission to deploy army with magistracy power as soon as possible to check election violence and ensure a proper election atmosphere. Nagorik Oikya convener Mahmudur Rahman Manna said the government cannot stop them with repressive acts, arrest and attack on their leaders and activist. "We know the government won't create a level-playing field. So, we've asked our leaders and activists to have patience until December 29, and endure all attacks and repressions. We won't reply to any repressive acts as people are getting ready to come up with a befitting reply to all unfair acts through ballot on Election Day." BNP senior joint secretary general Ruhul Kabir Rizvi alleged that around half of their total candidates have already been attacked across the country by the ruling party activists and law enforcement agency members. "Our leaders and activists are being attacked in all the 300 constituencies in presence of police." Rizvi said their candidates cannot paste or hang their posters due to obstruction by their opponents, let alone carrying out campaign through using loudspeakers, but the Election Commission is not taking any action against them.